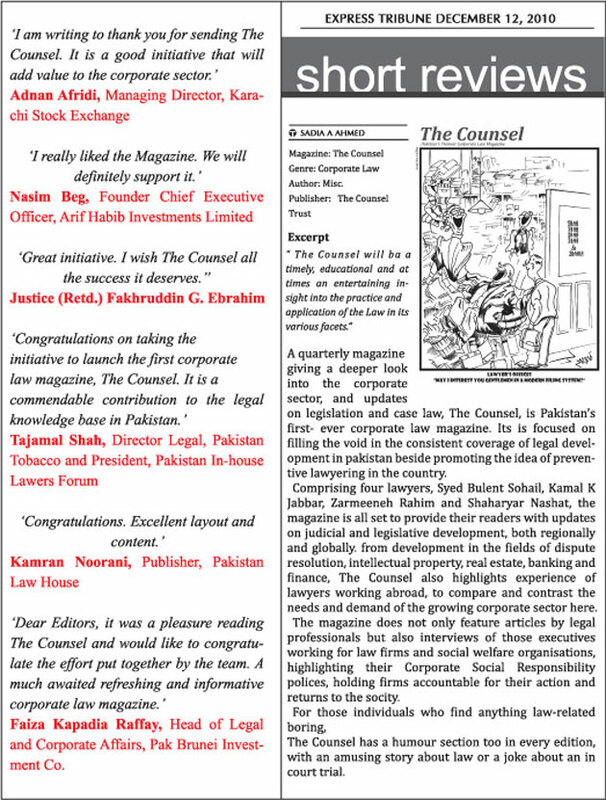 "The Counsel is Pakistan's premiere corporate law magazine reporting on matters that interest and impact corporations, business owners, governmental and non-governmental institutions, legal practitioners and the judiciary and other professionals involved in the corporate sector. As a quarterly publication, it will update its readers and provide them with an incisive analysis of legislation and judicial decisions as they develop in Pakistan, regionally and internationally. The project is initiated by The Counsel Trust which is registered not-for-profit trust. The Trustees include Syed Bulent Sohail (Advocate High Court and Senior Associate Orr, Dignam & Co.), Kamal K. Jabbar (Barrister-at-law, Advocate High Court and Legal Counsel, Wholesale Banking Standard Chartered Bank Pakistan), Shaharyar Nashat (Advocate and Legal Counsel ICI Pakistan) and Zarmeeneh Rahim (Advocate and General Counsel, L'Oreal Pakistan). The Counsel publishes both academic and vocationally oriented materials authored by corporate leaders, external and in-house legal practitioners, professors and judges including company secretaries and chief financial officers. It will be a timely, educational and often entertaining insight at the practice and application of the Law in its various facets. One of the core undertakings of The Counsel will be to highlight legislative, regulatory and judicial developments in areas of corporate law, including Company Law, Banking and Finance, Capital Markets, Corporate, Mergers and Acquisitions, Regulation, Insurance, Tax, Privatization, Pharmaceutical, Project Finance, Construction and Real Estate, Shipping and Aviation, Intellectual Property, Energy and Natural Resources, Litigation and Alternate Dispute Resolution, Telecommunication and Information Technology, Employment and Labour. The Counsel will greatly add value to the skills required of legal professionals responsible to their clients and organizations by tracking legislative measures and updating its readership on recent legislation and significant amendments. Further, major corporate decisions of the Superior Courts of Pakistan, being an important source of law, will be analyzed and critically examined with accurate summaries of decisions impacting the corporate and commercial law rendered during the relevant quarter. In addition to publishing opinion pieces by legal practitioners and articles by corporate professionals, the magazine shall have as its regular feature, interviews and discussions with eminent members of the judiciary and leading legal practitioners and corporate leaders thereby creating a forum for debate on legal trends and policies."